Huge piles of data files pertaining to records of the Chandigarh Housing Board are being digitised for easier access and customer satisfaction. Of the approximately 40 lakh data entries pertaining to accounts of nearly 45,000 flats, more than 22 lakh are accessible on the click of the mouse. By Independence Day, all records are scheduled to be on the software. In a bid to vacate prime land from slum-dwellers across the city, the Chandigarh Administration has decided to temporarily rehabilitate them at a suitable place in one of the southern sectors. More than 3.11 lakh investors have deposited a whopping Rs 4,148 crore with the Haryana Urban Development Authority (HUDA) for the 574 plots in Sector 27 and 28 here. Residents of the city have been asked to be prepared for power cuts in the near future. The cuts “may be” imposed as per the schedule followed earlier this year in April, an official press note said here today. A local court today extended the police remand of four accused in the PMET question paper leak scam of the Baba Farid University of Health Sciences’ (BFUHS), Faridkot, till July 10. 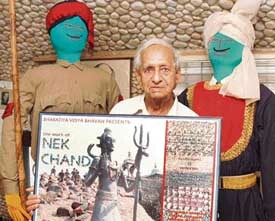 The international stature and growing eminence of Nek Chand does not seem to impress UT Administration. Why else should the Engineering Department sit over the veteran’s outstanding medical bills for almost a year and still not pass them. 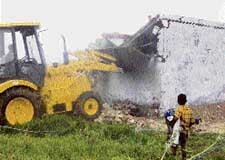 As many as 46 illegal constructions were demolished by the enforcement wing of the Punjab Urban Planning and Development Authority (PUDA) during a drive carried out in areas surrounding Mohali today. Mr Manmohan Singh Kohli was formally installed as the club president of the Rotary Club of Chandigarh for 2006 and 2007. The outgoing president Charanjit Singh presented the collar of club presidentship to him at the installation ceremony held here today at Hotel Aroma. To streamline the functioning of the Ex-servicemen’s Contributory Health Scheme (ECHS) and avoid inconvenience to patients, all ECHS polyclinics in the Western Command area are being networked with military hospitals in the region and those in Delhi. Besides, land is also being procured at a number of places to set up new polyclinics. Water shortage eased in Phase IX today following a protest against inadequate supply of water here yesterday. Officials of the Department of Public Health (DPH) said that water was provided for a longer time and with more pressure to the affected area. In fact, some residents of the affected pocket had stated that water had today reached even on the first-floor level. Irked by frequent unscheduled power cuts, hundreds of residents of the Lalru area gheraoed the local power station and blocked traffic on the Chandigarh-Ambala highway late last night. For a change, the Chandigarh Police today lived up to its slogan, “We Care for you”. A Mohali resident was in for a pleasant surprise this morning after two cops knocked at his door and handed him over his lost purse. The cops asked him to ensure whether the cash and other documents in the purse were intact. The Department of Tourism yesterday issued identity cards to seven youths from Khuda Lahora village to be posted as guides in rural tourism, recently introduced by the Chandigarh Administration. The Deputy Commissioner, Mr Tejveer Singh, has directed executive officers of civic bodies not to clear building plans of colonisers who obstruct the natural flow of water. The police has registered a case of negligence in connection with the death of a Phase-IV resident last night who had got electrocuted even as the Punjab State Electricity Board (PSEB) and the Municipal Council failed to take responsibility for the incident . The police today arrested a Darua-based midwife on an allegation of causing death due to negligence. The police said the accused had assisted in a delivery of a 24-year-old-woman of the same village on Thursday night following which the woman allegedly devolved complications and was subsequently shifted to the Sector 16 General Hospital, this morning, here, where the victim was declared “brought dead” . Making good use of technology available with the telecom companies, the Chandigarh Police yesterday managed to solve a robbery case in which two scooterist forcibly took Rs 13,600 and a mobile phone from a villager on June 13. The police has arrested one person in this connection, while his another accomplice is still at large. The local police arrested a Mauli Jagran resident on the allegation of committing a theft in a house in Sector 21-D. The police claimed to have recovered gold ornaments worth Rs 70,000 from his possession. Thieves decamped with a laptop computer and 12 tolas of gold from a house in Phase VI. The theft came to the notice of the houseowner, Mr Gurcharan Singh, when he came back to his house today. He had gone out of station to meet his daughter day before yesterday. Keeping in view the pristine, verdant and serene environment of the City Beautiful, the Chandigarh Industrial and Tourism Development Corporation (CITCO) has decided to introduce bike tourism — ride by bicycle in Chandigarh — to further tap its tourism potential and make it a tourist destination in a big way. In order to forge strong bilateral trade ties, a CII SME IT mission, visited the UK from June 26 to 28, coinciding with the annual CEOs mission. The mission was led by Mr Partap Aggarwal, Chairman, CII, Chandigarh Council, and managing director, IDS Infotech Limited. It comprised distinguished entrepreneurs representing the IT sector. The PHD Chamber of Commerce and Industry organised a seminar to create awareness in the small scale sector about the various schemes of the Government of India and other institutions dealing with small scale industry here on Tuesday. The Chandigarh Industrial Association in a letter to the UT Administrator has sought that the Industrial Area be named industry and business park or industrial business park. Mr M.P.S.Chawla, the president, said “the change in name will be an added attraction for multinational and overseas companies planning new ventures in the city”. In what is being considered a record of sorts, Panjab University prepared the results of the Punjab PMET within 72 hours of the test on July 2. The results were compiled by the university’s computer centre on behalf of the Baba Farid University of Health Sciences, Faridkot. The Sports Department, Chandigarh Administration, has decided to allot 538 seats of sports wings (355 schools, 183 sports coaching centres) in all the disciplines under sports wing scheme this year. A delegation of the Chandigarh Polytechnic Teachers Association, along with the Class III and IV unions of the Chandigarh College of Engineering and Technology, today called on the Joint Secretary, Technical Education, and submitted a charter of demands. Principals of various colleges sat on the floor in protest against the “indifferent attitude” of the Punjab Government towards non-government privately-aided colleges. The valedictory function of ‘National Workshop on Genetic Engineering’ was held in the Department of Biotechnology, Panjab University, here today. The workshop was sponsored by the Department of Biotechnology and the Department of Science and Technology. At least 15 mid-career scientists from all over India were selected to attend the workshop. Dr Pankaj Mala Sharma, Department of Music, Panjab University, was presented “Bharat Jyoti Award” at a seminar on “Economic growth and national integration” at New Delhi by Shri Mangat Ram Singal, Minister for Industry, Labour, Employment, Election and Land and Building, recently. Dr Sharma was chosen for the award by the India International Friendship Society, New Delhi, for her contributions in the field of music. Several students of Sri Sukhmani Institute of Engineering and Technology (SSIET) have got offers for training abroad. According to a press statement issued here today, Sunny Sharma is proceeding for professional training to the Capital Tools and Design, Ontario (Canada). Another student, Pritpal Singh is going for training to the Plantic Technologies, Victoria (Australia). Dr Anil Kumar, Reader in Pharmacology, University Institute of Pharmaceutical Sciences, has been selected for a prestigious Ole Rafaelsen Young Investigator Award in the field of neuro-psychopharmacology. The dharna of the Berozgar PTI Teachers Union, Punjab, going on in front of the office of the DPI, Punjab, entered the 11th day here yesterday. The agitating teachers are demanding the filling of around 1,000 posts lying vacant in the state. While it is still uncertain whether the Union Government will accept the recommendation of the department-related Parliamentary Standing Committee on Personnel, Public Grievances, Law and Justice for reverting to the pre-1993 system of appointment of Judges of the Supreme Court and the High Courts, the same has evoked sharp reactions from the legal fraternity here. 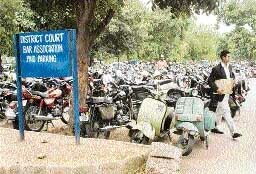 The impasse between the Chandigarh Municipal Corporation and the District Bar Association over the manning of paid parking outside the district court premises has ended. In a goodwill gesture, the Chandigarh Industrial Tourism and Development Corporation Limited (CITCO) will give concessions in hotel stay to Pakistani artistes coming to Chandigarh. For long, the Council of Scientific and Industrial Research (CSIR) has been engaged in developing initiatives for bettering the lot of India’s poor. The focus of research has been “moulding high technologies to suit the needs of the poor.” Some of the finest products of the innovative strategy line adopted by CSIR include the premiere research institute’s foray into the area of reverse pharmacology which reduces the cost of drug development making medicines cheaper. The PGI Foundation Day function took off to an intellectual start today with the scientist of the order of Dr R.A. Mashellkar, Director-General, Centre of Scientific and Industrial Research (CSIR), in attendance as the chief guest at the Bhargava auditorium. The seventh annual Laureus World Sports Awards held in Barcelona will be telecast on SaharaOne on July 9 at 5 p.m. The Laureus World Sports Awards are the global sports awards honouring sportsmen and women. The Laureus World Sportswoman of the Year Award went to Croatia’s ski star Janica Kostelic, who has won more Olympic Alpine skiing medals than any other woman.